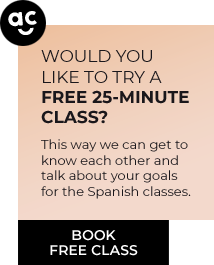 WHY LEARN SPANISH WITH ME? Some of my students tell you why. Different kinds of online Spanish classes, so you can choose the one that best suits your needs and goals. Designed for students already at elementary level (A2), since a foundation is required to be able to communicate. A blend of Conversation classes and ‘À la carte’ classes. As a DELE assessor, I help you to build upon your strong points and balance the rest. A blend of special DELE classes and ‘À la carte’ classes. Are you planning on travelling to Spain? In the city of Salamanca you can learn a refined and accent-free Spanish, making the understanding and language learning easier. I offer one-on-one classes or those in small groups of 2 students at my home.